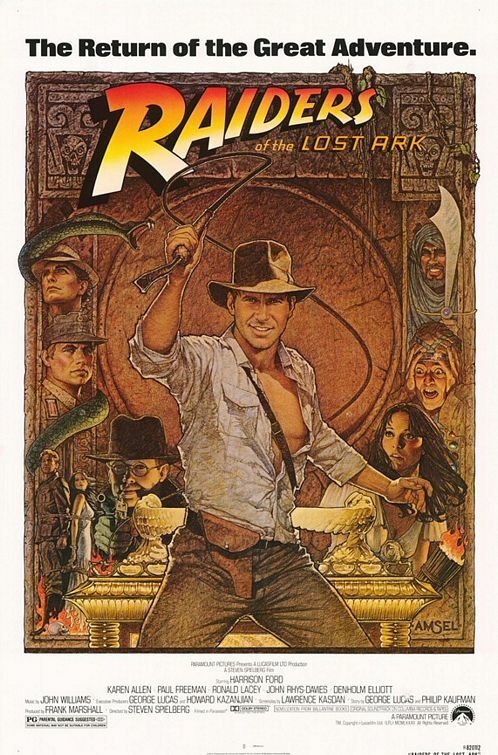 1936: adventurer Indiana Jones is hired by the US Army to retrieve the mythical Ark of the Covenant, which they believe is on the verge of being uncovered in Egypt, before the Nazis can get their grubby mitts on it. Professor of archeology, expert on the occult, and obtainer of rare antiquities, Indiana Jones. Good with a whip; not good with snakes. Dr. René Belloq, essentially the evil Indy: a fellow archeologist with fewer scruples, who often takes credit for Indy’s hard work and is now in bed with the Nazis. They’re most memorably represented by creepy Gestapo agent Toht, played by Ronald Lacey, who was cast because he reminded Spielberg of Peter Lorre. Goodness, where do we start? Well, how about the start! Having made his way safely through a boobytrapped cave, Indy switches a bag of sand for the idol he’s come to retrieve. Unfortunately the trap is not fooled, and Indy has to run out as the place collapses around him and all the traps are triggered — including, most famously, a giant rolling boulder. It’s only one of the greatest movie main themes of all time. Composed by John Williams (of course) it’s technically called The Raiders March, and is a combination of two ideas Williams wrote for Jones’ theme that Spielberg suggested be put together to make one piece. The climax, when the Ark is opened, was a field day for ILM. Techniques used include “animation, a woman to portray a beautiful spirit’s face, rod puppet spirits moved through water to convey a sense of floating, a matte painting of the island, and cloud tank effects to portray clouds.” Plus the villains’ heads melt (a gelatine and plaster model exposed to a heat lamp), collapse (a hollow model with the air sucked out), and explode (which nearly landed the film with an R rating). Have you heard the one about the scheduled sword fight and everyone being ill? You have? Oh, okay then. The film was a massive success, so has spawned tonnes of media. Primarily, three direct sequel films, with a fifth set for 2019. Then there’s the three-season TV series The Young Indiana Jones Chronicles, 13 adult novels, 33 Young Indiana Jones novels, 11 “choose your own adventure”-style books, eight German novels (which have never been translated into English), numerous comic books, and 19 computer games, including nine with original storylines and two Lego Indiana Jones games. Also, a stunt show at Walt Disney World in Florida based on Raiders that has been running for 27 years. Whew! George Lucas and Steven Spielberg teamed up for the first time here, recycled elements from movies beloved in their youth, and produced something new and exciting that is still a reference point for blockbusters 35 years later. (We’re getting homages to homages now, aren’t we? Weird.) It’s pretty much a perfect adventure movie: relentlessly paced, packed with action, lightened with humour, full of likeable heroes, who are brave and competent but also a little bit flawed, and hissable villains, with scene after scene of imaginative situations and fabulously staged derring-do. It’s perfectly distilled pulp adventure, and pure cinematic entertainment. Many Bothans… died to bring us #73. The man with the hat is back. And this time he’s bringing his dad. When an old professor goes missing while searching for the Holy Grail, there’s only one man to track him down: his son, Indiana Jones. With his father’s cryptic diary as a guide, Indy embarks on a race against the Nazis to be the first to find the Grail. Indiana Jones, the fedora-wearing, whip-wielding, quip-delivering, snake-fearing, Nazi-fighting archeologist adventurer. This time joined by his dad, Henry — who still has it with the ladies, apparently. A pair of deceptive deceivers: respectable American businessman Walter Donovan sets both Indy and his father in search of the Holy Grail, but he’s secretly working with the Nazis because he wants the prize for his own selfish ends. Then there’s Dr Elsa Schneider, who seduces both Joneses (bit creepy) and is also secretly working with the Nazis. But might she come good in the end…? Indy’s dad, Henry Sr, is along for the ride this time. Sean Connery was always Spielberg’s first choice for the role, as an inside joke that Indy’s father is James Bond. (Not literally, obviously.) The father-son sparring is one of the highlights of the film. Any time you get Ford and Connery playing off each other is fantastic, but the scene where they’re tied back-to-back to be interrogated by the Nazis, then have to escape the burning fortress (see: memorable quote) is one of the best and (importantly, for this category) most memorable. In previous films, computer-generated effects elements had been printed onto film and composited into final shots the old fashioned way, using optical printers. For Donovan’s death scene in Last Crusade, several states of the character’s decay were created with make-up and puppets, filmed, then ILM scanned the footage and morphed the takes together digitally. This was the first time film had been scanned, digitally manipulated, and then output back to film as a finished shot. Conversely, some of the other special effects have aged pretty badly — see-through planes and that kind of thing. On the bright side, Lucas never tried to Special Edition it. I know we’re all supposed to love Raiders most, but I think Last Crusade is actually my favourite Indy movie. After the darkness of Temple of Doom, and the resultant criticism, Spielberg and co set out to make a lighter adventure more in the vein of Raiders. It’s possibly the funniest Indy movie because of that, but without tipping over into all-out comedy, thanks to plenty of the requisite derring-do, an almost Bondian globetrotting storyline, and a high-stakes climax, complete with gruesome death for the villain. Spielberg once said it was his favourite Indy movie too, so I’m in good company. This review contains major spoilers. For a spoiler-free view, see my initial thoughts. I’ve grown up with Indiana Jones around. Not in the way Harry Knowles may have (apparently if you weren’t old enough to see the original trilogy in the cinema, at precisely the right age, then this film isn’t for you), but they’ve always been there. I was so young when I first saw Last Crusade (on video) that, even though it can only have been two years old at most, it was a film that had Always Existed as far as I was concerned (much like Ghostbusters and Back to the Future, or so many other ’80s movies that I love). I remember directing a recreation of Last Crusade in the playground (with me as Indy, of course, and one of my best friends hating me for days because he’d been Brody and I’d melted him at the end, my 6-year-old memory having confused the character with Donovan); loving Young Indiana Jones whenever they showed it on BBC Two; visiting the absolutely fantastic stunt show at DisneyWorld Florida; churning through a couple of the tie-in novels (carefully selected from the gift shop based on their blurbs); having the Raiders poster on my door for at least a decade; running around with my Indy hat and Nazi cap gun (wow, we must’ve bought a lot in that gift shop); wishing there were action figures for me to play with (and appropriating an Alan Grant from Jurassic Park for the task, because he had a vaguely similar hat)… There are many more Indy memories locked away in my head, but I think those examples will more than suffice. And so, about 17 years or so since I first encountered Dr Henry Jones Jr, I finally get to see him in the cinema. I don’t think I’m one to be easily suckered in by that thrill factor, however. I wasn’t one of the people who came out of Phantom Menace extolling it’s virtues only to later realise how disappointing it was; heck, I came out of Two Towers not with the feeling that after a whole year (wow!) of waiting Lord of the Rings was back and wasn’t it great — I thought it dragged for at least the first half and found Helm’s Deep somehow anticlimactic. I say this in defence of the fact that I enjoyed Crystal Skull and think it’s a good film, an opinion that seems oddly rare at the minute. I suspect this will change with time. That’s not to say the film isn’t flawed, mind. The opening’s a bit slow for my liking, there are few lines that are as funny or as quotable as in the other films, and some moments push things a bit too far — I’m thinking specifically of Indy escaping a nuclear test in a lead-lined fridge. It’s not as bad as Bond surfing the wave from a melting ice shelf in Die Another Day, but it’s not really in-keeping either. Another oft-cited problem is the amount of material the film awards to some of its starry cast members. Actors of the calibre of John Hurt, Jim Broadbent and… well, most people say Ray Winstone, but I think he’s overrated as an actor… still, they don’t get a great deal to do. The problem here is that they’re John Hurt, Jim Broadbent and Ray Winstone — replace them with unknowns and far fewer people would whinge about the size and point of their roles. Quite why an actor like John Hurt would accept such a small, almost one-note role (while there may be more depth to the character, it’s all revealed in Mutt’s memories rather than Hurt’s performance) is a different issue, but he does play the part well. The rest of the cast fare better: Shia LaBeouf continues to be a star on the rise, here blessed with a teen rebel who isn’t also incredibly irritating. Mutt has a heart, and we don’t have to suffer a two-hour ‘emotional journey’ to find it. He pairs well with Harrison Ford too, and one can see why George Lucas suggests a future for the franchise that emulates the father-son dynamic from Last Crusade. That said, Ford gets his best partner in Karen Allen’s Marion. She was always the best ‘Indy girl’, and while her return may be as surprising as Indy wearing that hat and carrying a whip (not just because we’ve seen her in all the trailers, but who else is it going to be when Mutt first mentions a Marion in the diner?) she plays a vital role in injecting some verbal humour and banter into proceedings. The only other noteworthy female cast member is Cate Blanchett as a villainous Russian psychic (maybe). She’s clearly having bags of fun with the part, and is rewarded primarily with a death scene that is pleasingly in line with those in the rest of the series. This is another moment some reviewers have whined about, saying we’ve seen it before, but personally I’d’ve been disappointed with anything less from an Indy film. Of course, this is all without really mentioning the man himself. Make no mistake, Harrison Ford is still Indiana Jones. The hair may be grey, the face covered in more lines, but the attitude and humour is still there. This is an older Indy, of course — he’s not only aged nearly two decades since we last encountered him, he’s also lived through the Second World War. The snippets of dialogue that explain what he’s been up to since we last saw him are all very nice for fans too, I think, but are pleasingly not dwelt upon for too long — this is a film that will work just fine for anyone who somehow hasn’t seen the first three. Ford can still hold his own in the action stakes too, running, swinging and punching his way through a variety of thrilling sequences. The screenplay could have used his age as a crutch, leaving him with some comedy running away while the much younger Mutt got stuck in; this isn’t the case, and that’s great. As for those action sequences, they’re a lot of fun. The best by far is an extended chase through the jungle, including a fantastically conceived sword fight on the back of two moving vehicles. There’s a good deal of silliness in it — Mutt’s Tarzan-like vine swinging, or Marion’s use of a handily-placed tree to get their car into a river — but this is a franchise explicitly inspired by the B-movie thrills of the ’30s, ’40s and ’50s, in which context these things are more than acceptable. It’s a little daft, but it’s all such fun that if you’re worrying about the realism you’re not entering into the spirit of things. More disappointing is some lacklustre CGI, which is used far more often than Spielberg might have liked us to believe. There’s also a bit with some large ants that may be a little too close to the use of beetles in The Mummy, but as that’s basically an Indiana Jones rip-off it seems only fair to return the favour. Finally, there’s the MacGuffin: the eponymous Crystal Skull (the “Kingdom of the” prefix isn’t really needed). It’s alien, as long-rumoured, which has undoubtedly angered some fans. Personally, I don’t find it any sillier than the Ark of the Covenant or the Holy Grail, equally unreal items (in fact, less real — maybe the aliens are too likely to be true for some viewers?) with equally fantastical powers. It also fits with the mid-50s setting, post-Roswell and heading into the Space Race. The design of the aliens and their saucer is pleasingly retro, though obviously achieved with CGI, and it does tie to theories that ancient monuments and civilisations had contact with aliens (again, true or not, they’re no worse than the religious artefacts of the other films). Like everything else about the film, the MacGuffin may not be quite as good as the equivalent elements in Raiders and Last Crusade, but it pushes close enough. Speaking of which, it’s worth quickly mentioning the UK rating. For some reason, Crystal Skull is a 12A while Raiders and Last Crusade are both only PG. I swear there’s nothing worse in this film than those; in fact, I’m sure there’s nothing here that’s as likely to be traumatising for youngsters as Donovan melting at the end of the third film. I expect it says more about our variable rating system than it does about the films themselves, but in the unlikely event anyone reading this is wondering about its suitability for a younger audience, there’s my thoughts. As I mentioned earlier, reaction to the film, both from critics and the general viewing audience, has been somewhat mixed. It seems plenty of fans have left their rose-tinted glasses with their DVD box set and viewed Crystal Skull with the all-too-critical eye of one who isn’t aware they don said goggles to watch the older films. Crystal Skull is a suitable return to the Indiana Jones series — full of fun and excitement, and a good chance to be reacquainted with old friends. It can’t beat Raiders because that came first, automatically embedding itself as the best in the minds of many; and it can’t beat Last Crusade, partly because it lacks the wonderful dynamic between Harrison Ford and Sean Connery, and partly because I just love that film. But, crucially, it is in the same league as them, and that’s fine by me. My initial reactions to Kingdom of the Crystal Skull can be read here. The film has now been out in the UK for just over 14 hours, and goodness knows how long elsewhere, not to mention last Sunday’s premiere at Cannes, so the ‘net is already packed with thousands of opinions and full-bodied reviews (almost 3,000 people have already rated it on IMDb, unsurprisingly placing it in the Top 250). Hundreds of thousands more will follow in the ensuing hours, days, weeks and years — I’m sure discussion of Indy isn’t going away soon. Nonetheless, I’m throwing out my thoughts onto my little plot of webspace, just in case anyone cares. I’ll post a proper review another time, but these are a quick handful of reactions having finished the film less than an hour ago. They are, as the title notes, spoiler-free. From the first shot it’s clear that a playful, entertaining spirit will pervade the film. It’s a bit of a slow open after that, but once it kicks into gear it’s excitement all the way. There are several exciting sequences, most notably the much-trailed jungle chase, so there’s no disappointment there. It also has the best idea for a sword fight since Pirates of the Caribbean 2. The MacGuffin is decent enough — not as iconic as the Ark or the Holy Grail, perhaps, but it more than serves its purpose. There are fewer quotable lines than you might hope, but the dialogue is still witty. It’s occasionally a bit silly too, but most of it’s in-keeping with the near-B-movie spirit of the franchise. Indy’s age is playfully acknowledged, but it doesn’t become an excuse — he still gets plenty of action and drives the story. There are nice references to his earlier adventures (including the TV series) and what he’s been doing for the last 20 years. Most fans will appreciate that, I think. One might argue (and some reviews have) that a few actors are underused in their supporting roles, but this is Ford’s film and they’re no worse than, say, Sallah in Raiders and Last Crusade — I doubt they cast John Hurt, for example, and then wrote him a relatively small part. As with the opening image, Spielberg ends the film with another playful beat aimed primarily at fans. To rank Crystal Skull in relation to the original trilogy, it’s the third best — but that’s behind Raiders, a certified classic, and Last Crusade, one of the first films I ever saw and which I love dearly. Aside from those, it stands head and shoulders above many other action/adventure films. Will it hold up as well as Raiders has in 27 years’ time? Who can say. But right now, it’s damn fine entertainment. A proper review of Kingdom of the Crystal Skull will appear as #32 in the next few days, following my review of Iron Man.